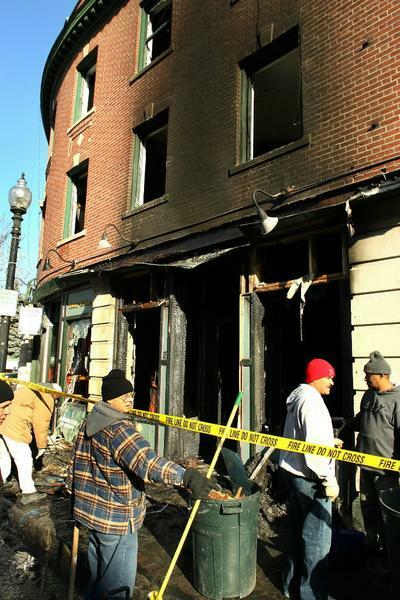 As reported on Boston.com, a four-alarm fire destroyed and damaged 8 businesses and left 20 people homeless in Hyde Park this past Saturday (early am). This building is directly across the street from my office, so my window looks out over the devastation. There are two restaurants affected by this sad situation… Rincon Caribeno Restaurant and the space formerly occupied by Murphy’s Country Kitchen. The owner of Rincon had just recently signed a new lease for Murphy’s previous space… planning to open a second restaurant. He plans to rebuild, so I will keep you posted as the construction happens. I regret to say I have yet to try Rincon, as it was still new (only 4 months old) and the previous owner’s reputation was quite bad. That said, I look forward to trying both of these locations once the owner rebuilds. I am assuming that Rincon will still be Caribbean/Dominican fare and I’m excited to see what they decide to put in a few doors down. We’re desperate here in Hyde Park… so make it something good please!